PDF Watermark| How Do I Add Watermark to PDF on Mac? Solved! A watermarked PDF file contains a digital watermark that protects your personal & confidential documents from being illegally copied by others. A watermark can be in the form of a text, image, date, signature, logo, or page number - that appears more likely as a stamp. How can I add watermark to PDF documents to protect copyright information? Below is a step by step guide to show how you can insert watermark in PDF documents on Mac (macOS 10.14 Mojave) without any hassle. PDFelement ProPDFelement Pro is a professional PDF editor, which will provides you the easiest way to add watermark to PDF files. With the help of this watermark creator, you can easily add image watermark to PDF documents, you can also choose to add text watermark to a PDF with ease. Moreover, you can even add multiple watermarks on a single PDF page or add watermark to multiple PDF files. First download the PDF watermark creator and run this software, click on the "Open File" option to choose the PDF file you want to add watermark. Click on the "Watermark" button and select the "Add" option. On the right side of the main interface, you can create watermark with ease. 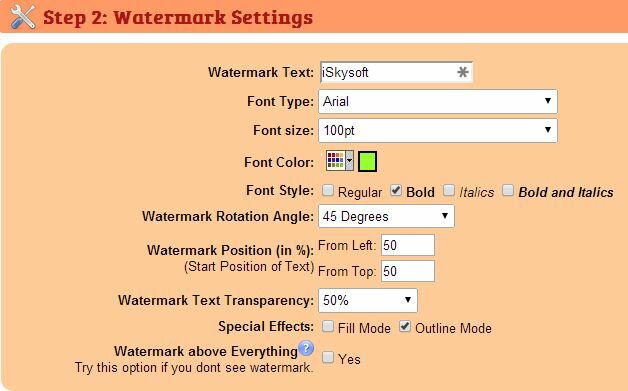 Firstly, watermark could be created from text, image and another PDF file, and you can set the font and color of watermark. Secondly, from "Appearance" option, you can set rotation, opacity, scale and location of the watermark. Last but not least, the position of watermark is up to you. And you can also decide to add watermark to every page or specific page on the PDF file. Click "Add", the watermark you created will be stick on PDF file. With this watermark creator, you can also add watermark to multiple PDF files. 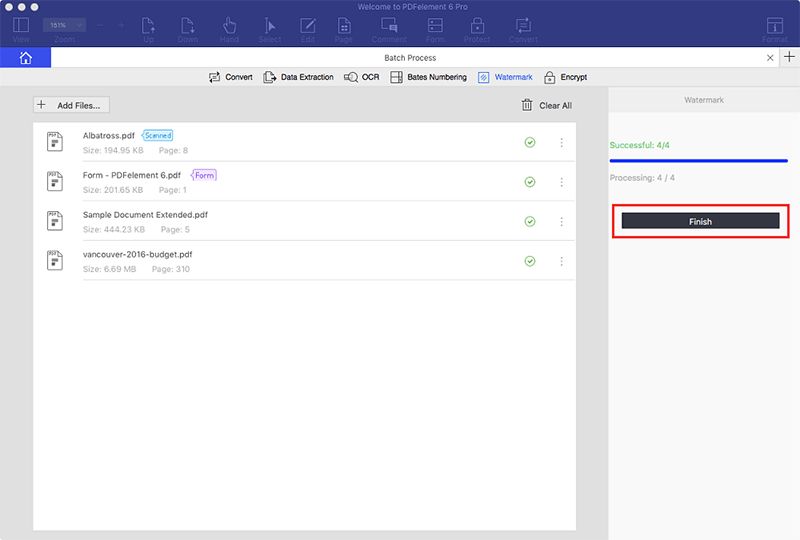 Back to main interface, click on the "Batch Process" button and select PDF files you need to add watermark. Click "Watermark" on the tool bar and "Next" on the left to begin the process of batch adding watermark to PDF files. Batch add watermark to PDFs is as easy as the way of adding watermark on single PDF file in "Step 2". After you watermark PDFs, click "Add" to choose a folder to save watermarked PDFs. 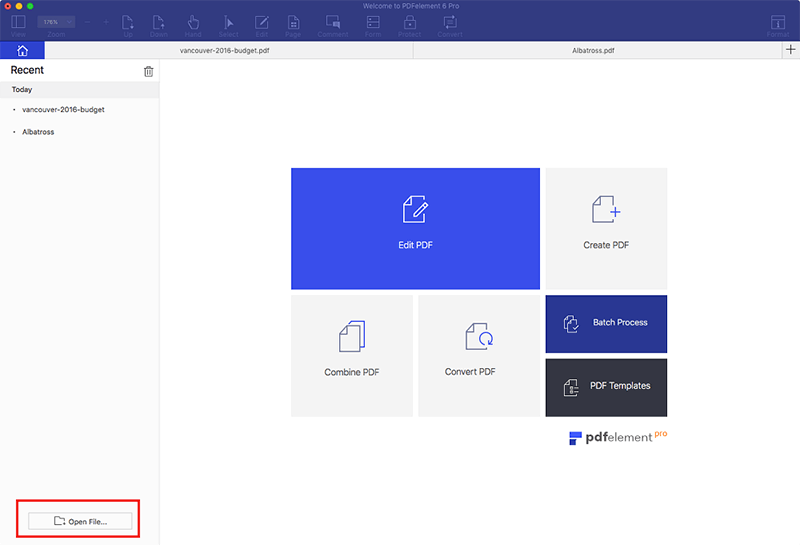 After you selected folder to choose the watermarked PDF files, the watermark PDF file will be saved within seconds, click "Finish", you will find these on your folder. To add watermark to PDF, you need an editing tool such as PDFelement ProPDFelement Pro. 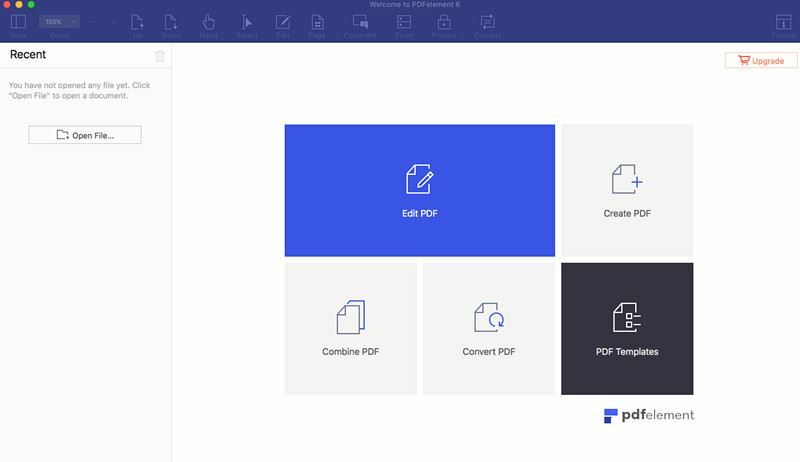 PDFelement Pro is designed professionally as an user-friendly application and comes with many amazing features: that will allow you to edit PDF documents just as you would do with a word processor. The feature to watermark a PDF is just one of the many options available. This PDF watermark for Mac (macOS High Sierra) tool also allows the encryption of PDFs with password; the creation and conversion of PDF files from Excel, Word & PowerPoint as well as to easily add markups and annotations to PDF documents. Watermark a PDF with text or image, and provide options to customize the watermark. 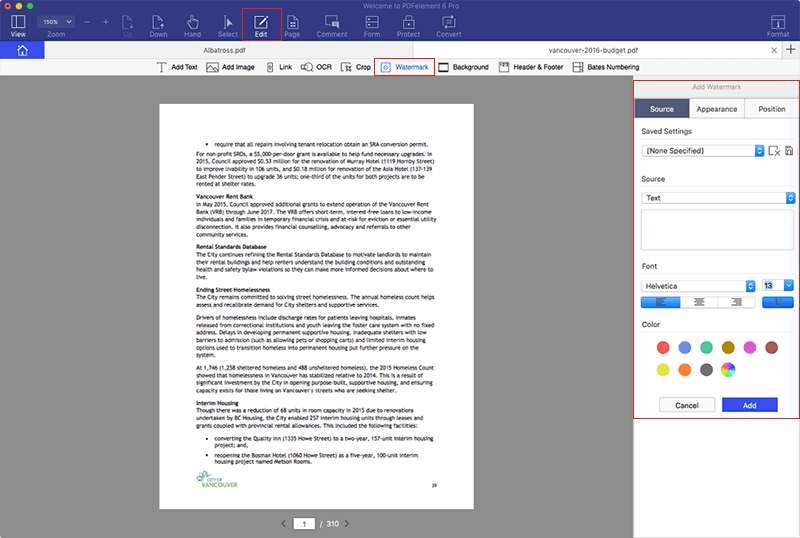 Edit PDF and fill out PDF forms just as you would do with a word processor. Enables you to encrypt PDF with password, and decrypt secured PDF easily. Convert PDF files to Word, Excel, PowerPoint, EPUB, HTML and other files. Create PDF from Webpages, Text files, HTML and more. You also can find some free online PDF watermark creator from the Internet. These online tools allow you to upload your PDF file to the site and customize the watermark directly without download any applications. Here are top three online PDF watermark creators that I recommend to you. Those 3 online tools will help you to watermark PDF online with ease. PDFCandy is an online tool that enables you to add watermark to PDF online for totally free. 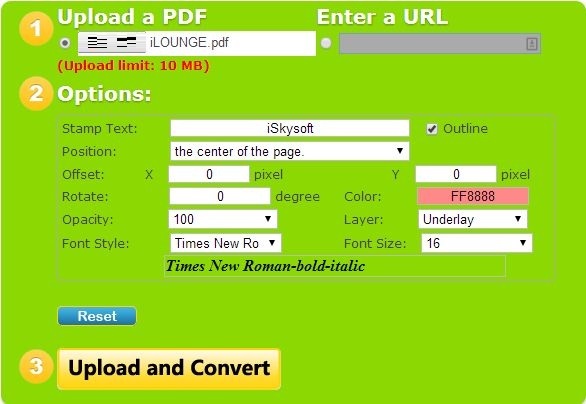 After uploading your PDF file to pdfaid.com, you can start to type the watermark text and customize the font, size, position and other elements of your watermark. This online PDF watermark creator is also a simple tool to add watermark to PDF online directly. You can also get options to personalize font type, font size, font color, font style and position of the watermark text. However, you cannot preview your watermark before you download it. And if you want more features on watermark, you have to go to the paid version. The VeryPDF online watermark tool also provides you a convenient way to watermark PDF online as you want. You can upload your PDF file or enter the URL for the file to add watermark but you have to keep the file size within 10 MB. 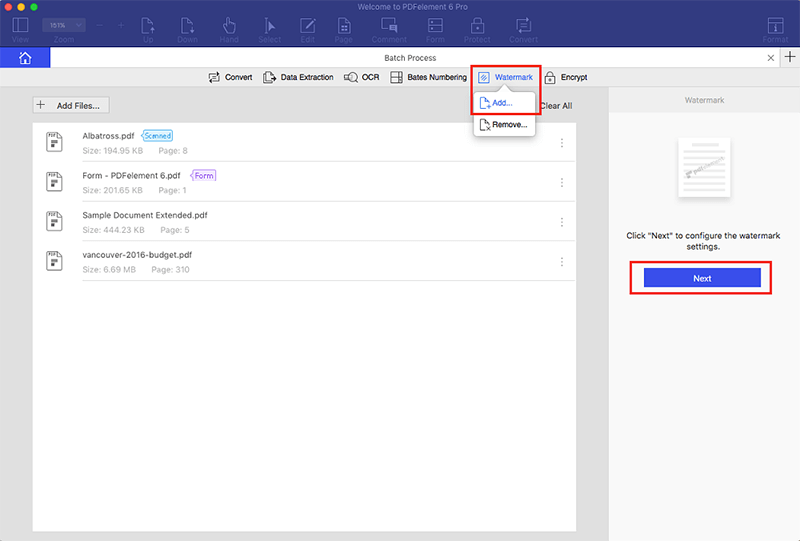 And you can get specified options for the watermark position but cannot customize the position as the above two tools. The watermarked PDF file can be directly downloaded to your local folder.